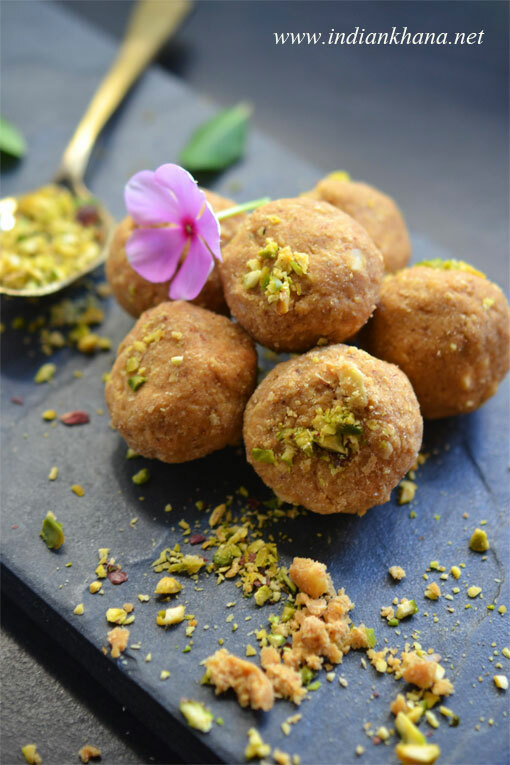 If you look for some easy yet yummy sweet which is also vegan and glutenfree for Ganesh Chaturthi celebration then try this ladoo, it's quite easy to prepare and with minimal ingredients plus it's a good change from regular besan or coconut ladoo here we bring good of both worlds :) My sister and brother-in-law simply loved the ladoos and half of it was gone in minutes. 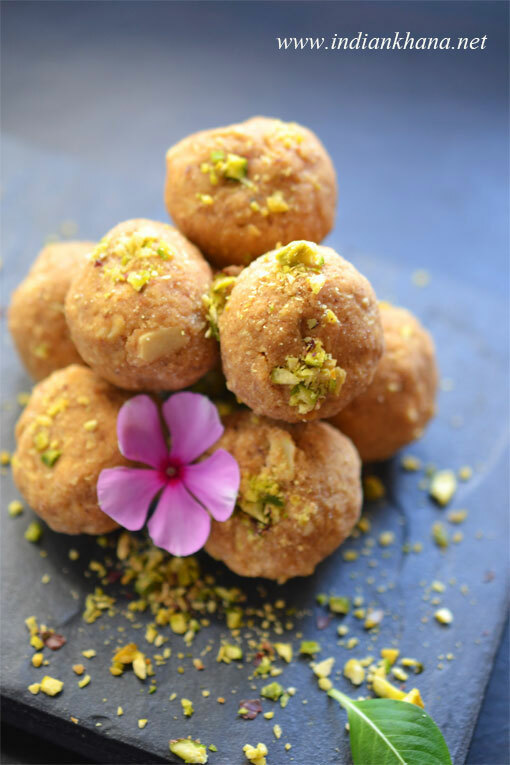 This time I made the ladoo quite rustic so you can see these ladoo are not properly shaped and I did that on purpose and totally loved the texture and shape, it's adds different dimensions don't you agree? The two ladoo that I make the most are Sooji (Rava) Ladoo and Besan Ladoo, it's my duty every time to make ladoo whether I am in parents place or in-law's place so this time I thought of doing something different and added coconut along and it was yummy ladoo. Though it's taste more of besan but you can sure feel the coconut flavor too and as I used coconut oil it's adds more flavor to the ladoos. 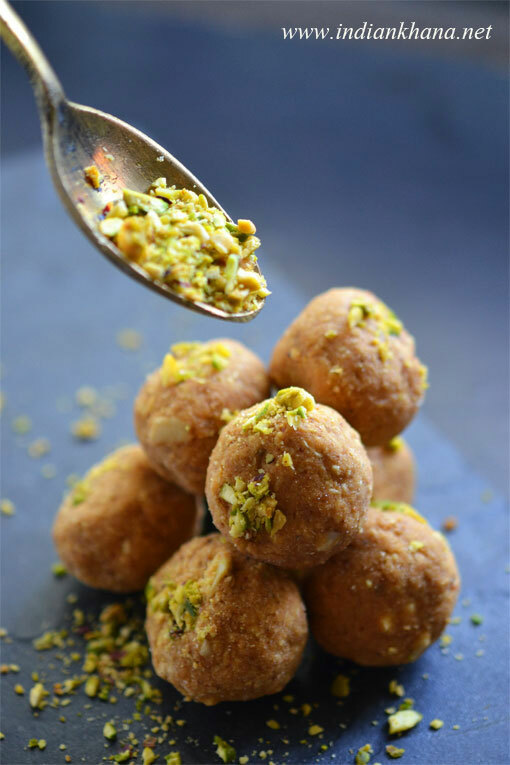 I made these ladoo last week for DH birthday as after years I didn't bake any cake for him but I wanted still to do something special so thought of making this ladoo. But since DH doesn't like ghee atall I used Virgin Coconut Oil replacing ghee so he can get it without making fuss after all this goodie is for his birthday and he happy ate too. 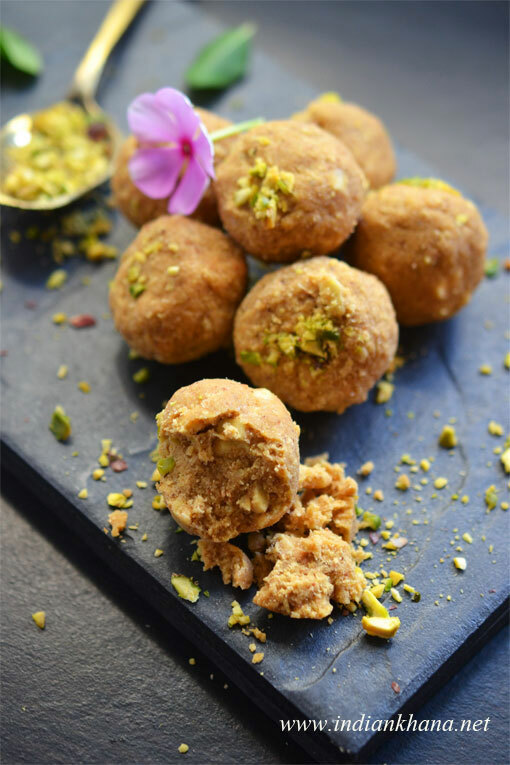 During this festive season like Vinayakar Chaturthi, Diwali these ladoo recipe can be handy for you to prepare for Naivediyam or for family and friends. 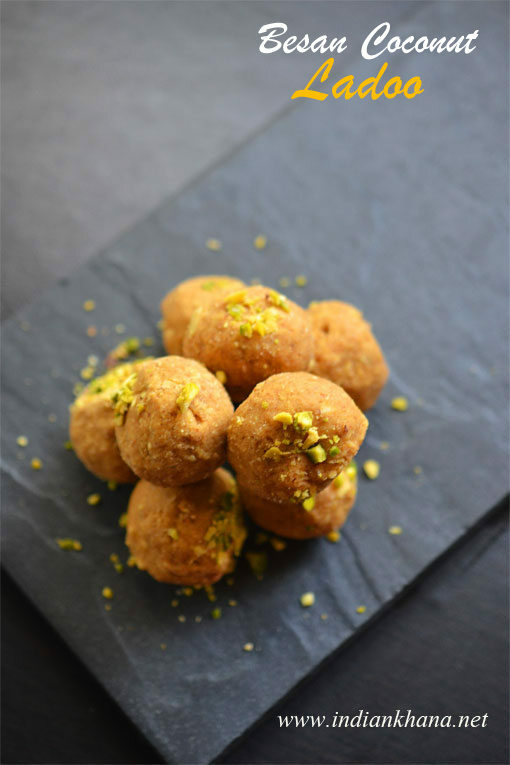 Do try this simple Besan Nariyal Ladoo and let me know how you liked it. 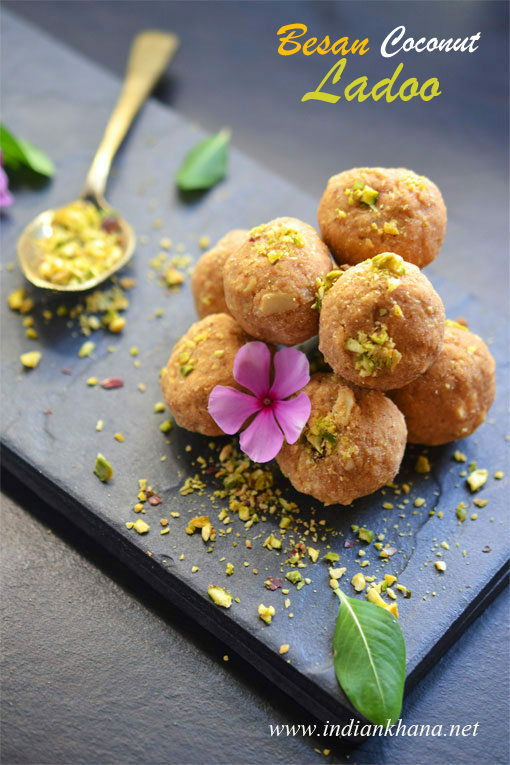 Rich, delicious and vegan ladoo with gram flour (besan), coconut, sugar, coconut oil and nuts. Grind sugar with cardamom seeds into powder. Chop almonds and cashew nuts in to small pieces, finely chop pista keep aside.. In heavy bottom kadai/pan, add almonds, cashew pieces and roast for a minute. Now add dessicated coconut and roast for a minute in low flame, trasnfer to a bowl and keep aside. In the same kadai kadai/pan, add sieved besan/gram flour or kadalai maavu. Roast besan in low flame until aromatic and light brown with non-stop stirring. Since I didn't sieve the besan before I sieved it after roasting and got lumps as you can see in pic. Collect the besan lumps and run in mixer for 20-30 seconds, if needed add more besan. Now besan should be without any lumps, add it along with rest of roasted besan. Allow besan mixture to cool down for 5 mins and then add sugar powder, mix well until sugar combines (coconut and nuts was already in the bowl). Allow mixture to cool for 5 mins or warm enough that you can handle. Now add coconut oil or ghee and mix well to combine. Take small portion of mixture, press into ball/ladoo shape. The mixture will be still warm so be careful. If you are not able to bind the ladoo and it's breaking then add 1 tbsp of melted coconut oil or ghee at a time and try again. Finally roll ladoos over chopped pista or just dap ladoo on top of pista. Lay ladoo in a box or plate and let them dry, if you feel ladoo looking soft, after they gets dried for some time it will be fine. If you don't like coconut oil then you can use 1/2 cup melted ghee. Sieve besan before roasting to avoid any lumps. If you forget like me then follow the steps as I have done. 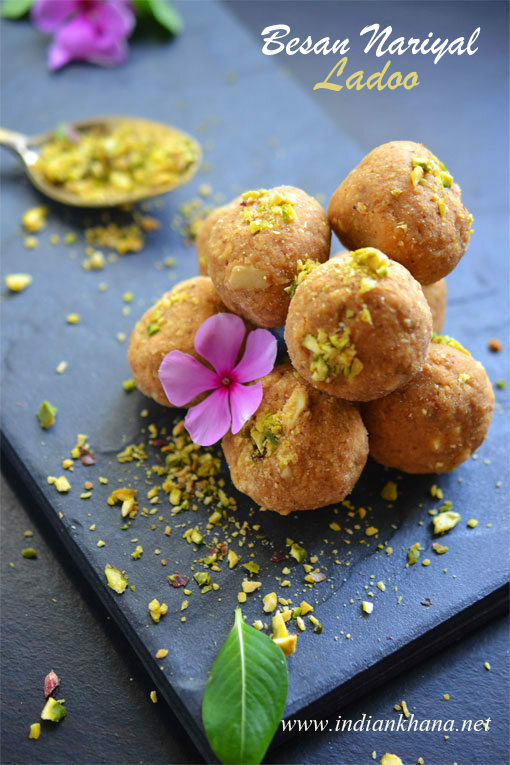 Delicious, Vegan and Gluten-free Besan Coconut Ladoo for Bappa or to make any festival is ready.